Does anyone have any specific recommendations of good devices which can scan 35mm astronomical slides to file? Some of the slides are quite dark, so would value any experiences of specific devices. I need to convert a number of slides to file to help create a computer presentation for an older member of my local society. My brother has successfully scanned in slides on an Epsom V300 flat bed scanner. (after the dedicated slide scanner he had failed to work beyond windows 98.). See the example Hale Bopp image (copyright my brother). I'm not sure what the max. resolution of this scanner is, or what software jiggery pokery needs to happen after the initial scan. With technology "improving" the whole time it might be worth just trying scanning on your printer! I still use a quite elderly Epson 3170 Photo. This is a general purpose flat bed scanner but it has a built in light source in the top panel and came with a set of film holders (for 35mm mounted/unmounted and 6x6 format). I really like mine. Eight years ago, or so, I scanned all of my existing 35mm slides, turned them into digital images and then processed them as such using Photoshop. The scanner I used was a Canon 8400F. This was flat-bed scanner with plastic inserts to hold the slides in place whilst they were scanned. It worked very well and I had no problems. Although the inserts could take 4 slides at a time which could then be automatically scanned I found it better to fully load the plastic insert and then manually scan each slide in turn. At the time my scanner was operated by a Windows XP laptop. Since then I have replaced the laptop with one operated by Windows 7 (the scanner driver would still operate in a reversionary mode). More recently I have found that a new laptop using Windows 10 will not interface with the scanner. Fortunately I have already completed scanning all of my slides and prints! To summarise the process works fine providing, as ever, that the scanner will talk to the computer. The digitised images are then processed as normal using an image processing software. Thanks all. A non-astronomy friend is going to lend me something to try out, so I will report back. I am surprised the flat bed scanners (I have one) would have sufficient resolving power to convert a 35mm slide into a reasonable quality image, this may be something I could try with my own scanner. and you should find it. I gave up and got a cheap scanner at Maplin. Sorry, not astro slides - just our street party in 1977. Historically I had a Minolta Slide Scanner (using SCSI board) and further to that an Epson flat bed scanner bought after research for 6x6 cm scanning, Moving on from 'history' you should consider the use of something like an Ohnar Slide Duplicator with your DSLR. The duplicators should still be around as S/H items or you could go to SRB (UK company that makes one of these ) at just short of £60). They reccomend the use of the 18 to 55 mm lens on the DSLR used for the job.SRB make adapters for lots of photo kit. 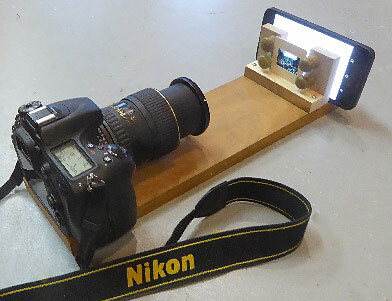 If you have a digital camera with a macro lens you could rig up something like this. Never thought about using my DSLR! I've just ordered one from ebay. I will report back! Many thanks again. Thank you. My Canon 6D effectively has a full frame, so I should be OK. I also used a Minolta slide scanner (with SCSI interface card) for many years and it was a brilliant performer. Sadly, one day it bit the dust and I couldn't get it to work again. Having thousands of 35mm slides that hadn't been scanned I decided to purchase a Plustek dedicated scanner (around £200) which works quite well and can certainly handle astronomical images well. I don't think the quality of scanning is a good as the Minolta but it was a third of the price. I ran it under Windows 7 for a while but haven't installed it on my newer Windows 10 PC yet. I've attached a couple of scans. I got hold of a Sunagot Delus Slide Duplicator second hand online. It looks like it was made in the 1970s or 1980s, so pre-digital cameras, so a bit confused what it was designed for.